We arrived at the 1939 Old Tucson Studios at the 10:00AM opening time. We were soon on a guided tour with a guide that seemed to know every movie ever made at the studio and was on a first name basis with John Wayne, who was one of the owners in the studio. Over 300 films have been made here including A Star is Born (1976), Cannon Ball Run (1984) and Tombstone (1993). After the tour we attended Miss Kitty's Can-Can Review, followed by a gun fight. I filmed the gun fight but it went on so long I had to quit and missed the gunslinger falling off the roof. This is a very interesting place and the staff tries hard to please. We had lunch at Big Jake's BBQ and had some of the best bbq and ribs I have ever tasted. Mavis and I split a huge plate that cost just $13.50. Our next stop was Saguaro National Park. The saguaro cactus is the supreme symbol of the American Southwest according to the park's brochure. The visitor center shows an excellent narrated slide show on a large screen. 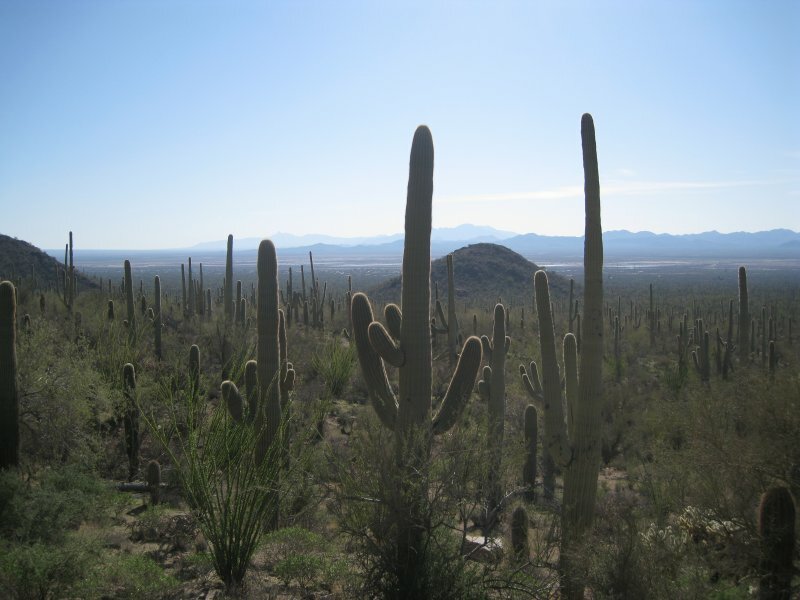 At the end the screen rises, the curtains open and you look out at a vast saguaro forest. We hiked part way up Apache Peak and took today's photo that looks out over Tucson.